From Petersburg, marked in red, we crossed the channel in our inflatable DIBs to a private landing pontoon on Kupreanof Island. 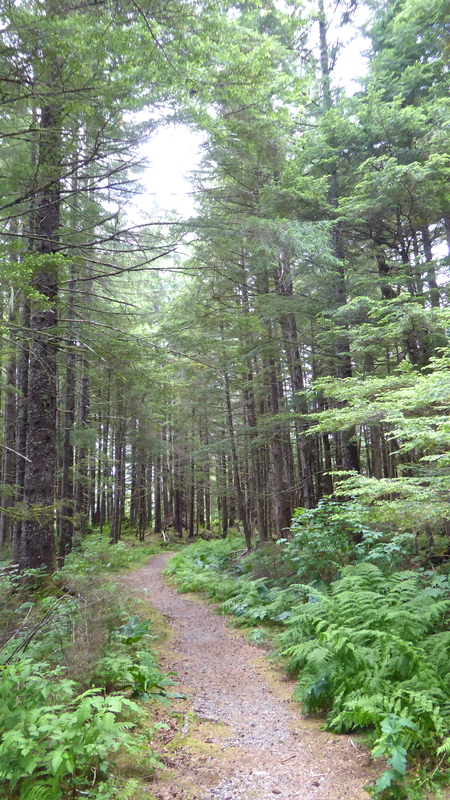 From here we hiked into another part of Tongass National Forest to seek out some more of the native flora of the region. One of the tricky parts about taking this whole expedition was that most landings were, of necessity, wet landings, requiring “wellington” or “mud” boots to negotiate the landing from the DIBs into icy waters and onto rocky shores. I chose to do none of the wet landings as I was being extra cautious of the slippery, wet, rocky shorelines. Why? My travel insurance didn’t cover any problems with my knees since it had been less than 24 months from my latest knee operation. Without cover, medical help in these parts would have been extremely expensive, to say the least. I had other adventures which I shall write about later. However, as no boots were required for this walk, I chose to join David and experience the forest with him. There was just one slight problem… the tide was well and truly out and the ramp from the landing pontoon to the walkway at the top was exceedingly steep! I took a very deep breath and inched my way a little nervously up the wet, wooden ramp. 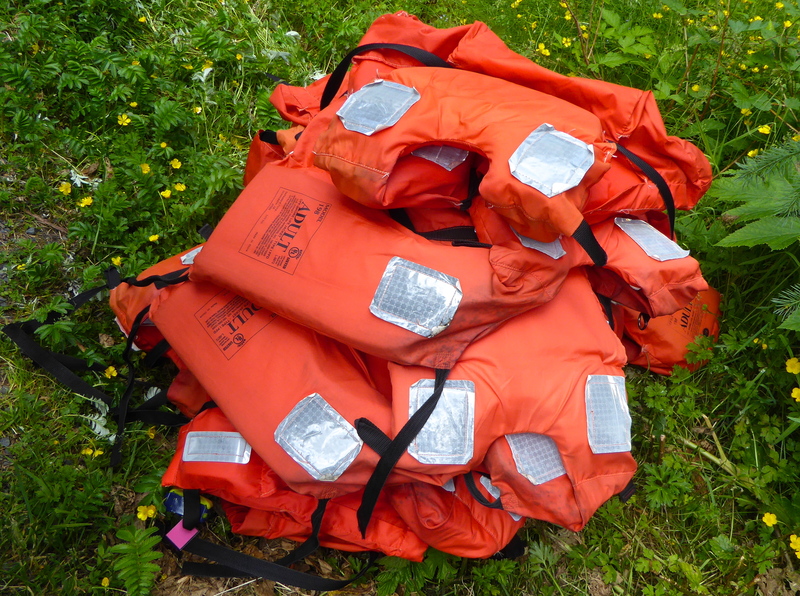 At the top, we divested ourselves of our life vests and just left them on the grass in amongst a patch of yellow buttercups. It was a wonderful feeling to be able to trust that they would remain there until our return! A patch of lovely Forget-me-nots, Myosotis sp., also grew close to the path. Before we left the shoreline and entered the forest shade, we were delighted to find some the bright red berries of Rubus spectabilis, Salmonberry. We just had to try them and indeed they are quite tasty… as well as being a spectacular berry, as its name suggests. Our first stop was at a small wooden ‘kiosk’ where Caroline showed us the map… that’s an important part of forest walking, just in case you lose your way. Not that that was likely to happen as it was a single file pathway and board walk for most of the way. I was most impressed that this trail facility had been built by the students in the High School’s construction class; each student has been recognised for their contribution. And I was further impressed that this project was a collaboration between several sections of the Petersburg community. That, too, was recognised by a plaque. 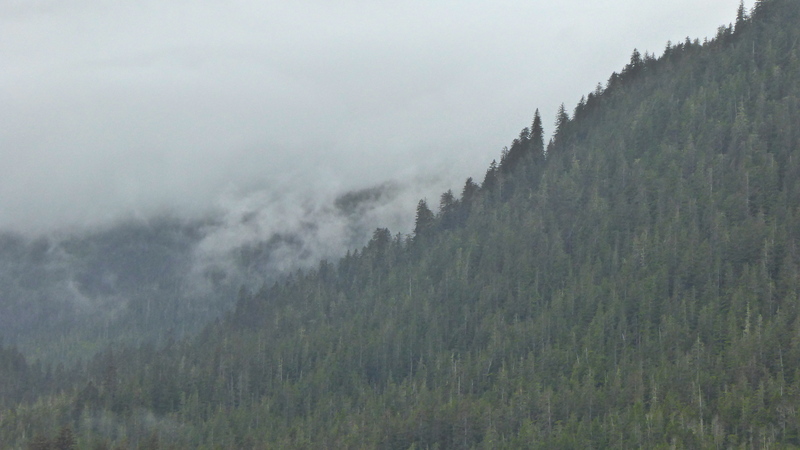 This is a National Forest and, as such, logging can be undertaken in a controlled way. The trees along this path by the shore were quite young… reforestation in progress. The path was edged with ferns. Lysichiton americanum, Cabbage Skunk was also much in evidence. long before paper and plastics! Skunk leaves are not only large, but quite sculptural as well. This one was close to perfection. There were more wonderful shapes and textures in the leaves of the understory. This was a great area to look for fungi. How elegant is this? Yes. David was down on his knees again for this shot. Another example of the delightful False Azalea; Menziesia Ferruginea. David had found one of these on his first walk. 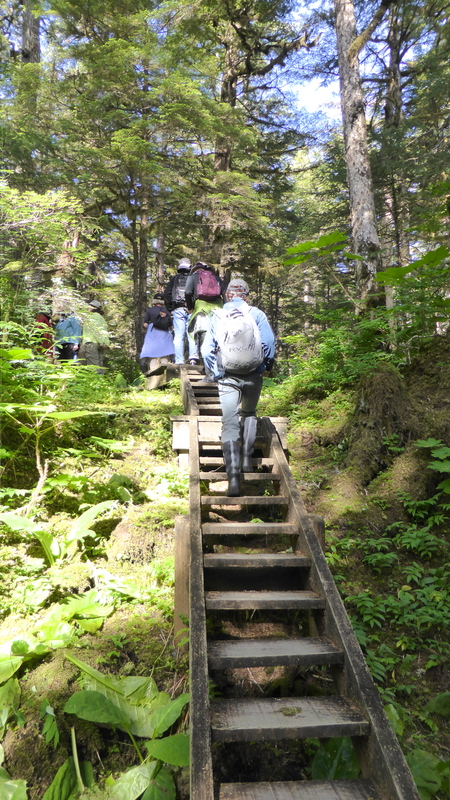 After following the path parallel to the shore, we came to the start of the board walk that would take us along the Kupreanof Trail, up through the old growth forest to a boggy, muskeg plateau on top of the hill. It was a bit of a huffy, puffy walk with a great many steps of uneven height to negotiate, but there was plenty of interest to see along the way. There were several dead or dying trees along the way. When a tree dies and falls in a forest, it continues to play an important role by creating a light gap in the forest which provides the opportunity for new life. To begin with, here in this damp environment, the fallen trunk is quickly colonised by mosses. Then, as it rots, it becomes a ‘nurse log’ on which the next generation of forest trees will germinate and begin to grow. The forest floor here was littered with fallen limbs and trunks overgrown with moss, giving the place a slightly eerie feeling. The boardwalk was still single file but at least it was two planks wide. Further up the hill we came to some lush forest with lots of healthy understory growth. Moss had certainly taken up residence on this small, dead tree trunk. This was a beautiful example of Cornus canadensis; Dwarf Dogwood or Bunchberry. The higher we climbed, the more daylight we began to see. 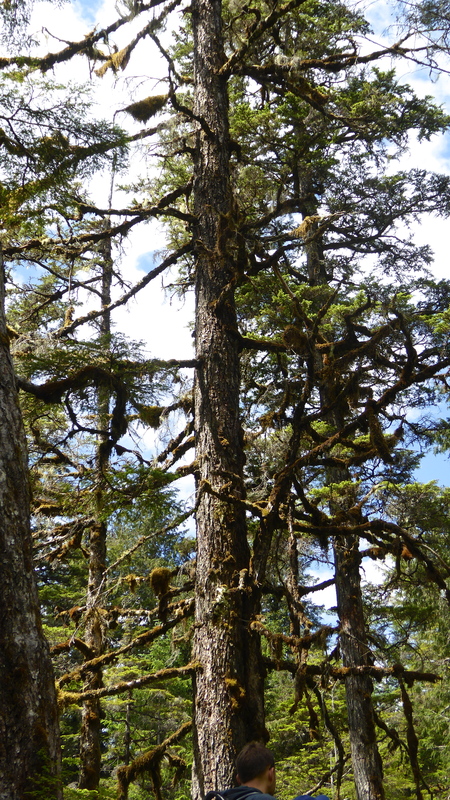 In this clearing, a brown moss had taken hold on almost every branch of a tall conifer. was covered in lichen and a cream coloured, feathery moss. Up another flight of steps and we had finally arrived at our destination for the afternoon, a plateau of boggy muskeg with quite a different group of plants to enjoy and photograph. We’ll look at them in the next diary posting. After a memorable day shared with whales and icebergs, Captain Shawn Nettles took the “Sea Lion” for a quiet after dinner twilight cruise into a narrow fiord. This was a wonderful way to unwind in the peace of the wilderness, shared only by a small fishing boat. The time; 9.15 pm. Summer twilight. The ship’s lights came on and it was time to think about bed. What adventures would the morrow bring? We anchored overnight in a quiet cove and everyone, including all of the crew, had a really good night’s sleep. So, we were all up bright and early, ready for whatever the day held. 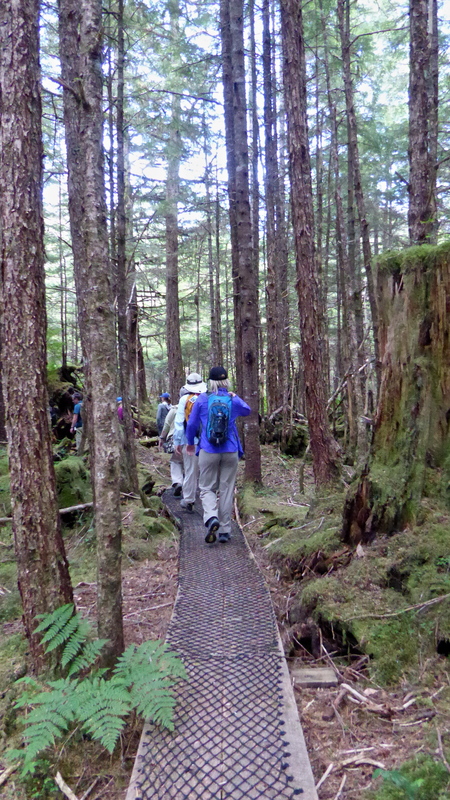 While we enjoyed our breakfast and a chat with new friends, “Sea Lion” cruised back up Frederick Sound, to a very special place named Ideal Cove for the first activity of the day, a walk in the forest. There was only one way to get to the shore, and the forest, and that was by DIB. These inflatables were stored on the ship’s roof, right above our room. They had to be winched down each time we had a shore excursion. Our lady bosun, Nicky, was in charge of these boats and of the kayaks which would be used later in the expedition. Lee Moll, was the first leader ready in a DIB to take walkers over to the shore. Lee, was our expedition plant specialist and has been leading walks here for many years. She was especially helpful with her extensive knowledge of the area. Loading a DIB was quite simple really, especially in these calm waters. The DIB was nosed into a loading ramp at the back of the ship, and one of the crew handed each passenger down into the craft. Before leaving the ship, we each had to ‘log off’ our name on a board (and, of course, remember to ‘log on’ when we came back to the ship!) David is already on board this DIB, in the shadow on the left. Jason, one of the expedition leaders, is his driver. and, for David, plants to find. 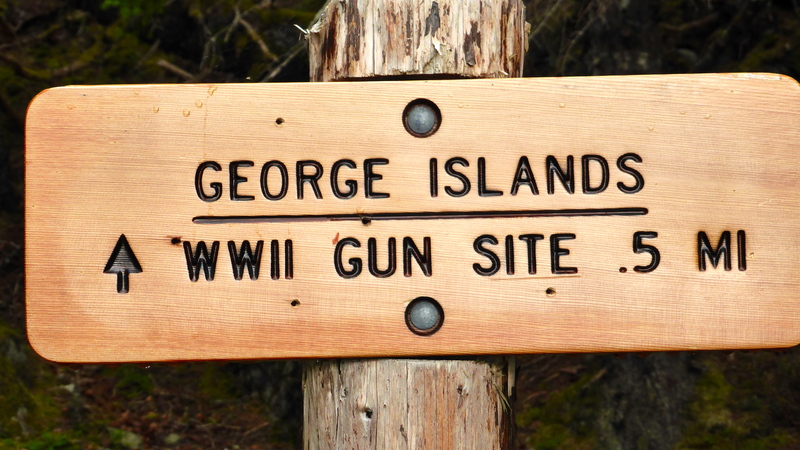 Once on shore, after a wet landing in boots, life jackets were left in a pile, cameras and binoculars were made ready and the walk began into the depths of the conifer forest. So let’s go with David and experience the forest and its plants through his photos. The very first thing you’ll notice as you enter the forest is that a great many of the conifers are festooned in a shaggy, cream coloured moss. Known commonly as Cat-tail Moss, it is indeed common. It’s botanical name is perhaps less well known: Isothecium myosuroides. these elegant fungi are non edible toadstools. A single file boardwalk protects this fragile environment. Beside the path are low growing plants like this Cornus canadensis, known as Dwarf Dogwood or Bunchberry. The short stalked leaves are particularly lovely; 4 to 7 of them in a whorl. Four petal-like white bracts protect the central umbel of flowers. Each flower has an explosive pollination mechanism. When the petals of mature but still unopened flowers suddenly reflex, they ‘catapult’ their pollen loads into the air. The fruit of the Bunchberry are bright red berries, fleshy and quite sweet. Bears love them! And this was bear territory so the group needed to keep a good look out for bears on this walk. and taking photos down to low is something that David does really well. We can enjoy the results. This ‘shelf’ fungi, attached to a tree, was much more at eye level height. Shelf or bracket fungi are resilient and may live for a very long time. They gain nourishment from the host tree and may in fact contribute to the death of that tree, feeding off the dead wood for years to come. Many types of sphagnum moss can be found in these forests; this one, known as Shaggy Sphagnum, is Sphagnum squarrosum. The leaves, which are formed in dense, shaggy, rough rosettes, can absorb a great amount of water. 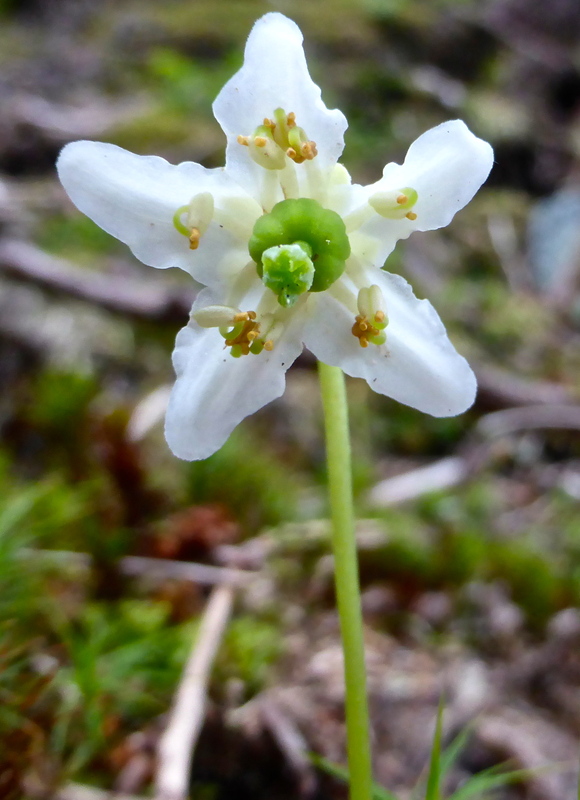 Plants such as these are very common in the forests and were used by native Alaskan peoples as baby diapers (nappies) and bedding, by women for personal hygiene and also for the dressing of wounds. This berry is probably well known to most as a popular fruit for the table. However, the ones we eat are much sweeter and larger than these native blueberries, a Vaccinium sp. In David’s words, “ours have been horticulturally tinkered with to satisfy our sweet tooth palettes”. But the locals enjoy these native blueberries… and so do the bears. The boardwalk is covered with the netting used by purse seine fishermen to catch fish; an ingenious use of a ‘ready to hand’ product in this area. It’s use makes the usually wet boards safer for walkers. And speaking of walkers, where are they? It looks as though David’s been so busy checking out the plants, that the rest of the group has gone ahead! Time to catch up. And time to finish this post and resume from here next time.